John Cachero Photography had the pleasure of photographing Sarah and Jason, who celebrated their wedding ceremony and reception at the Harrison Opera House in Norfolk, Virginia. If you haven't seen it already, you can get a quick peek of this wedding in the AltDaily.com featured article "A Wedding Story: Getting Hitched in Hampton Roads". If you are coming from AltDaily and/or are looking to see the majority of the rest of the photos from Sarah and Jason's wedding, check out the video slideshow below! John Cachero Photography had the pleasure of photographing Vy and Tom, who celebrated their wedding ceremony at St. Pius X Catholic Church and their wedding reception at the Half Moone Cruise And Celebration Center in Norfolk, Virginia. John Cachero Photography had the pleasure of photographing Christine and Chally, who celebrated their wedding ceremony at St. Pius X Catholic Church and their wedding reception at the Half Moone Cruise And Celebration Center in Norfolk, Virginia. John Cachero Photography had the pleasure of photographing Kristen and Jeremy, who celebrated their wedding ceremony and reception at the City of Williamsburg Community Building in Williamsburg, Virginia. I have to hand it to Kristen and Jeremy for being prepared with a contingency plan and being able to roll with what the weather had dealt them, because on the day of their wedding, an incredible snowstorm (rare for Hampton Roads) put a halt on their original plan to have their wedding ceremony at the Jamestown Memorial Church at Historic Jamestowne. Their caterer did a phenomenal job transforming the reception site into a suitable ceremony site and, with absolute grace, Kristen and Jeremy had a beautiful and fun wedding as the snow continued to fall throughout the night. I would like to thank Rebecca Franklin (primary shooter on this wedding) who allowed me to help capture this wonderful evening. Congratulations, Kristen and Jeremy! John Cachero Photography had the pleasure of photographing Angie and Thomas, who celebrated their wedding ceremony and reception at The Ivy Inn Restaurant in Charlottesville, Virginia, just one mile from the Grounds of the University of Virginia. Driving up from Hampton Roads to spend a weekend in Charlottesville to shoot this wedding was exciting, having attended UVA as an undergrad. I'd been looking forward to this weekend for quite some time since I hadn't been back in the Hook for a few years. My good friend, Emma, owner of Jordan Bloom, had been getting her hair done by Angie for a while. So when Angie hired Emma to take care of the floral arrangements for her wedding, Emma recommended that I take care of the wedding photography. After making a few phone calls and checking out my portfolio online, Angie and Thomas hired me sight unseen. These two were great to photograph. 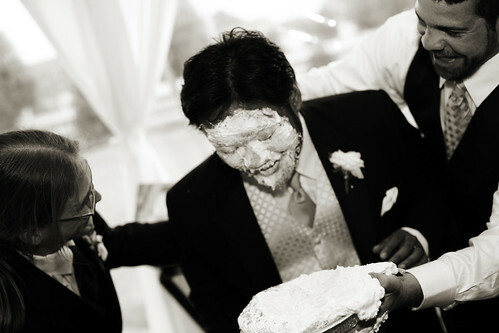 Angie and Thomas were fun and easy going, and their intimate wedding, friends, and family reflected this. I want to thank them for giving me an ample amount of time following the ceremony to take portraits. I always appreciate being able to explore our surroundings with a newlywed couple. John Cachero Photography had the pleasure of photographing April and Jonathan, who celebrated their wedding ceremony at Holy Trinity Catholic Church in Norfolk, Virginia and their wedding reception at The Cape Henry Inn And Beach Club in Virginia Beach, Virginia. April was the second bridesmaid from Deanne and David's wedding to hire me to shoot her wedding after being impressed with the results of my work (the first bridesmaid to hire me, Melissa, booked me to shoot her wedding a few weeks before this one). In addition, Jonathan happens to be David's youngest brother, so I had to live up to quite a reputation going into this wedding. I was prepared to shoot the lights out. That morning, we were blessed with sunny skies, but Hurricane Bill threatened to make landfall at some point during April and Jonathan's day. Not long after the ceremony, Hurricane Bill decided to sit right off the coast of Virginia Beach, unleashing plenty of rain on our beachfront reception site at Fort Story. Hoping that they'd be troopers, I grabbed two large umbrellas from my car and asked the newlyweds if they wanted to go shoot portraits in the rain. With the help of Jonathan's oldest brother, Jeremiah, holding an umbrella over me, the four of us ventured out into the weather and managed to capture some of my favorite portraits I've shot thus far. Thanks, April and Jonathan... you were awesome. Congratulations! John Cachero Photography had the pleasure of photographing Melissa and Bryan, who celebrated their wedding ceremony at Talbot Park Baptist Church in Norfolk, Virginia and their wedding reception at Vista Point Center on the Norfolk Naval Base. Melissa was a bridesmaid in Deanne and David's wedding, my first event of 2009. She and Bryan had already booked a photographer for their wedding, but after experiencing how well I interacted with everyone during that wedding and then being impressed with the actual photographs when they were made available, Melissa and Bryan apologized to their photographer, forfeited their deposit, and booked with me instead. I was happy they did because I had a great time shooting Melissa, Bryan, and their 14 fabulous bridesmaids and groomsmen. Congratulations, you two. One more thing... Melissa and Bryan booked Norfolk's own Grant Austin Taylor to play a set with his band during their reception. This is not hyperbole when I say this; Grant is a virtuoso on the guitar and his set was AMAZING. If you ever get a chance to hear this 14-year-old prodigy wail on his guitar, do it. I took several shots of the band during their set and I posted my favorite black & white shot of Grant in the set below. John Cachero Photography had the pleasure of photographing Laura and Scott, who celebrated their wedding ceremony and reception inside and on the terrace of the Garden Cafe overlooking the Japanese Garden in the gorgeous Norfolk Botanical Gardens in Norfolk, Virginia. Eric Fadden lent his talent and assisted me on this glorious day. I'd like to thank Laura and Scott for giving me the time and opportunity to briefly pull them away from the reception. The three of us explored the rest of the gardens and, together, we were able to capture the color, the beauty, and the love surrounding their special day. Congratulations, you two.